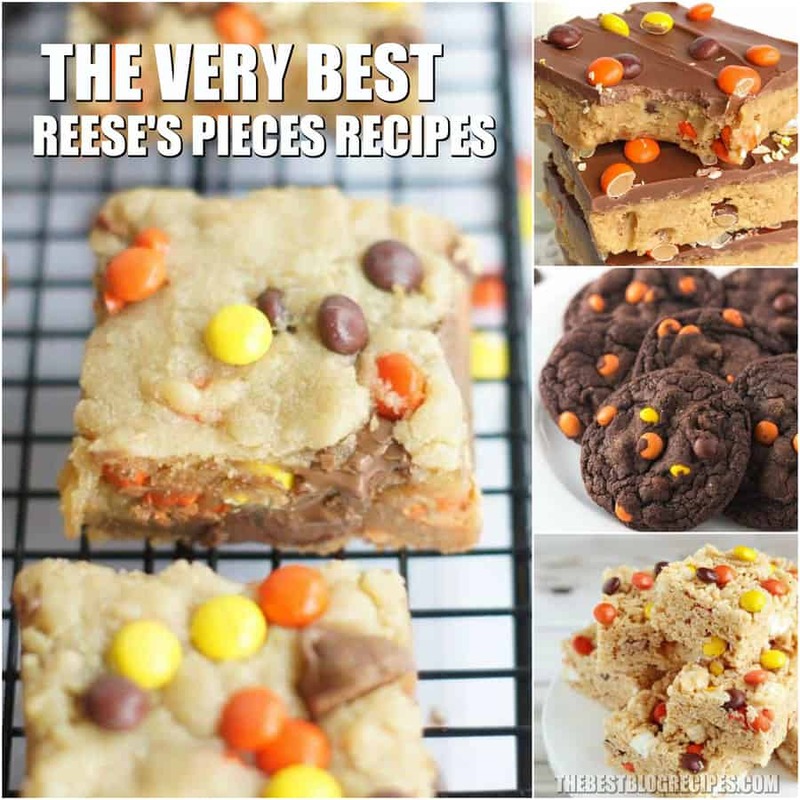 The Best Reese’s Pieces Desserts are some of the most amazing recipes you will ever try. The combination of our favorite candy with traditional desserts is something that will never get old! Try these recipes when you need a no hassle dessert that everyone will love and adore! Okay, I am so obsessed with Reese’s Pieces. Seriously, I think I could eat five pounds of Reese’s pieces all by myself in one sitting. I love chocolate peanut butter treats and the fact that Reese’s Pieces are bite sized and hard to stop eating make them extremely dangerous. Combine my addiction to Reese’s Pieces with all of my favorite classic desserts and I seriously cannot get enough. The desserts in this list are to die for. Trust me, you will be so glad that you stumbled across this collection of the Best Reese’s Pieces Desserts. I know that I am! 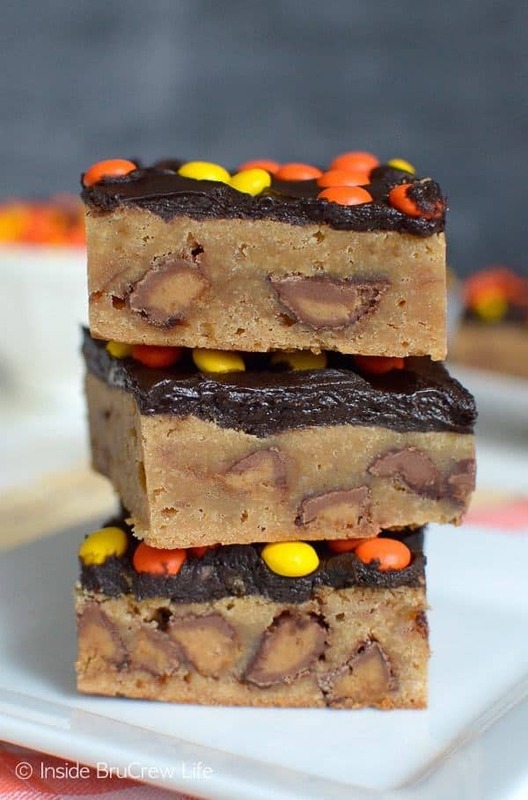 I can’t resist the gooey centers and delicious taste of these Reese’s Pieces Desserts! You will love how easy the Best Reese’s Pieces Desserts are to make. A lot of the recipes in this list are traditional recipes that you are already comfortable with making. All you will need to do is just add the Reese’s Pieces. If you ever make Monster M&M’s recipes, you will notice that the recipes in this list are very similar when it comes to their instructions and processes. 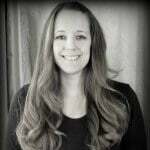 I know it seems like it might be tricky, but if I can do it so can you! With so many amazing recipes in this compilation, it isn’t a shock that they are perfect for pretty much any occasion. 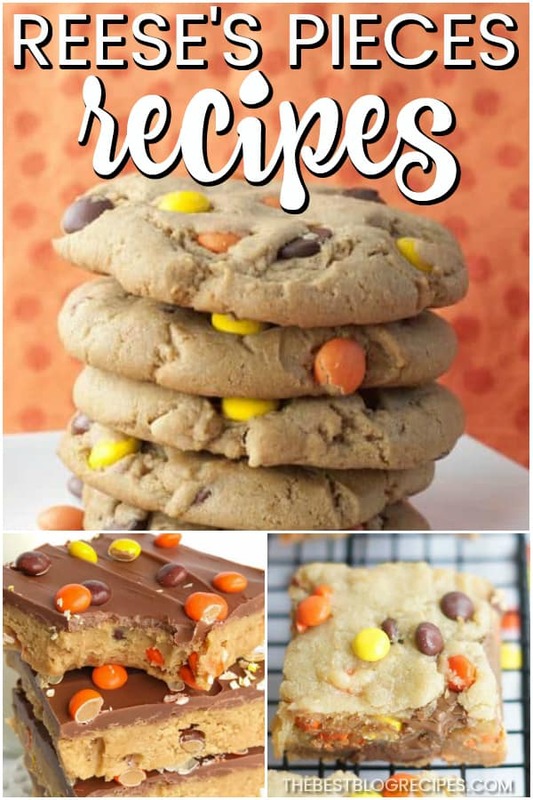 I will go ahead and share with you my favorite times to share Reese’s Pieces Recipes, but keep in mind that really any time is a great time to whip up a batch of Reese’s munchies. I love the Best Reese’s Pieces Desserts around Halloween time. Because of the colors of the candy, they make such festive and adorable treats for the holiday. Not to mention they are super kid friendly. Try making the recipes in this list for your Halloween parties this year. 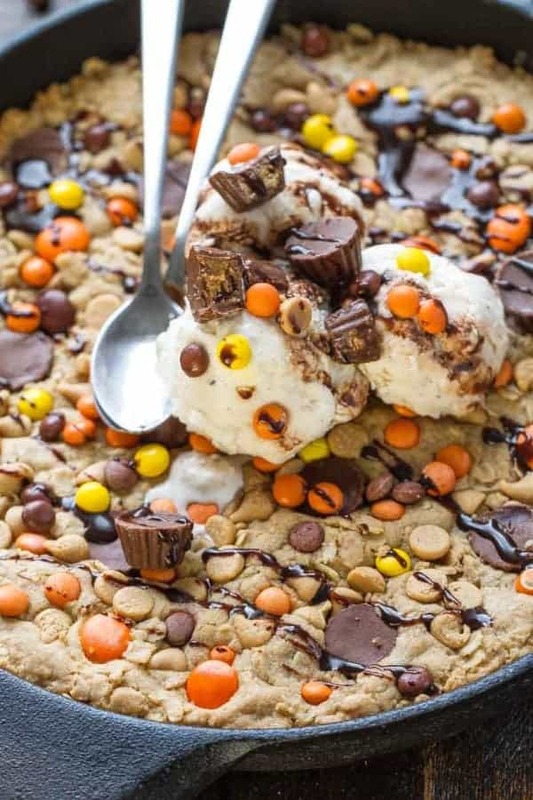 Really any fall party is a good excuse to serve the Best Reese’s Pieces Desserts. Make sure to try them out this year, you won’t be disappointed! From Inside Bru Crew Life :: Click HERE for the RECIPE Looking for an easy, but different brownie to make this week? 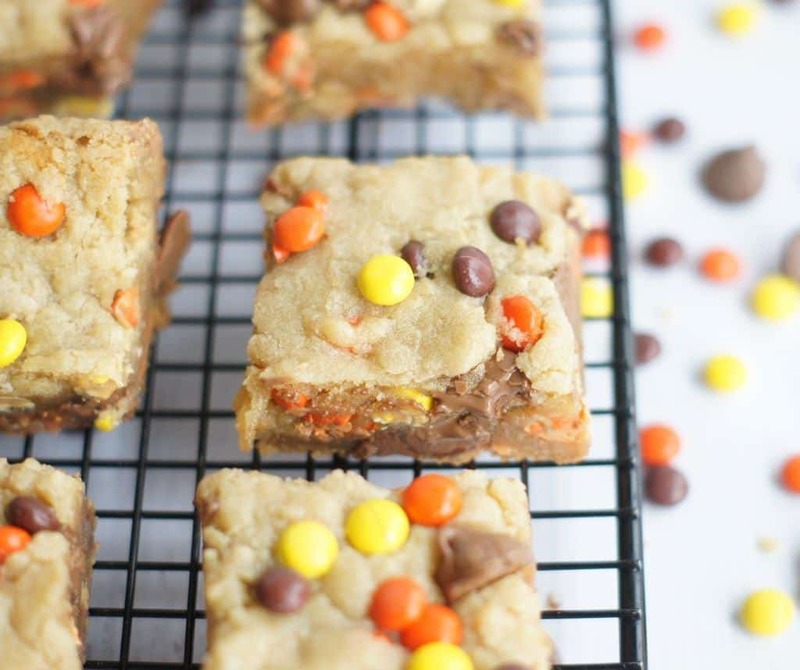 These Reese’s Peanut Butter Bars are just the treat for you. Three times the peanut butter goodness in every bite will have you reaching for more. From Fake Ginger :: Click HERE for the RECIPE How incredibly delicious does this milkshake look. It is creamy, sweet, and will be a new family favorite. 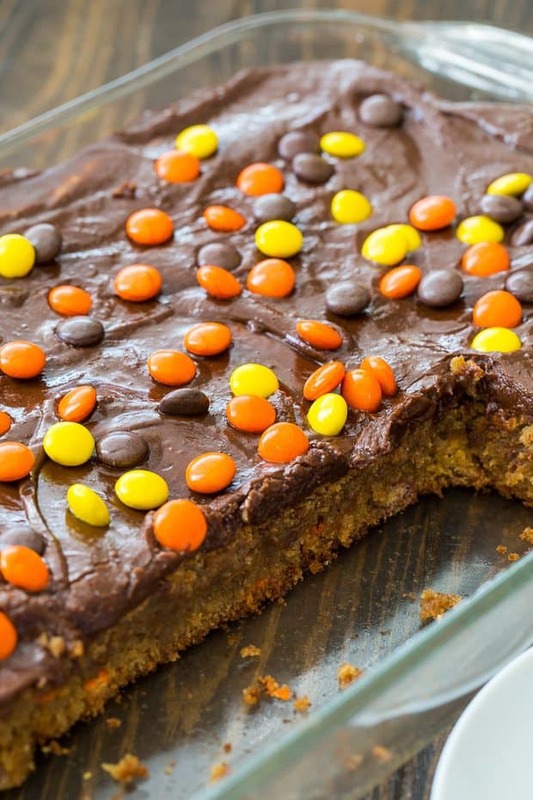 From Spicy Southern Kitchen :: Click HERE for the RECIPE Reese’s Pieces Peanut Butter Bars have so much peanut butter flavor and a thick layer of rich chocolate frosting. 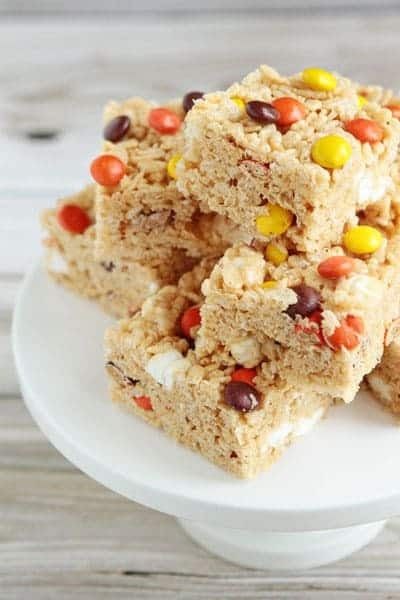 Reese’s Pieces candies are sprinkled on top and added to the batter for lots of crunchy candy flavor. If you want a dessert with lots of peanut butter, this is it! 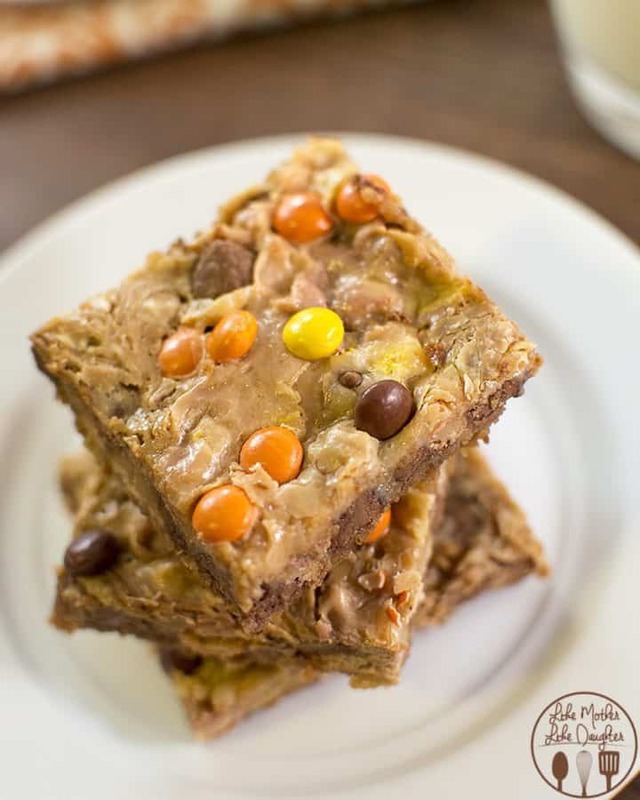 From Together As Family :: Click HERE for the RECIPE Reese’s Pieces Peanut Butter Bars are an easy, no bake treat that’s loaded with chocolate and peanut butter. They taste exactly like a Reese’s! 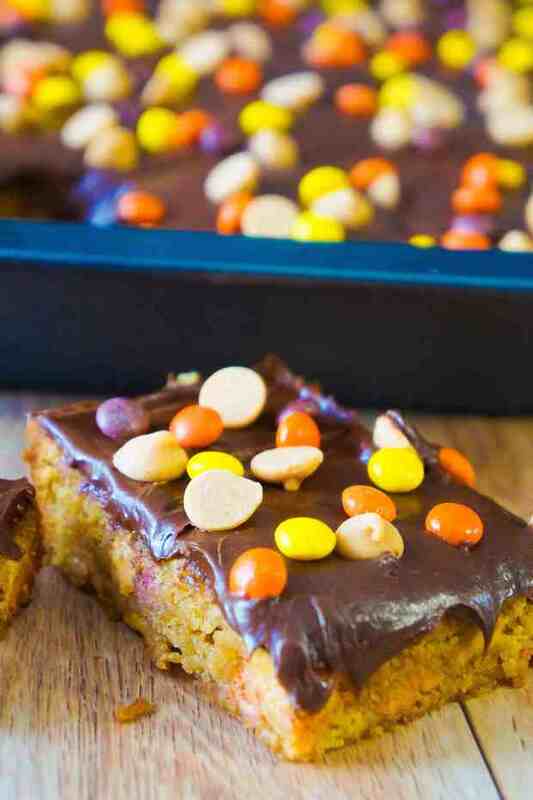 Add in some mini reese’s pieces for the ultimate chocolate & peanut butter dessert. From Sweetest Menu :: Click HERE for the RECIPE Dreamy creamy Peanut Butter Cheesecake is on today’s menu. 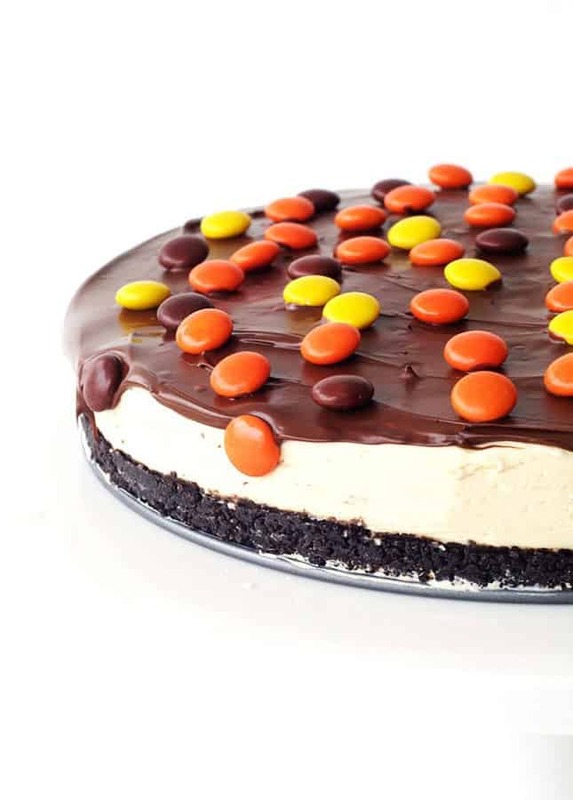 With a sweet Oreo cookie crust, a thick and fluffy peanut butter cheesecake filling, a drizzle of dark chocolate and a scattering of crunchy Reeses Pieces. Peanut butter lovers (like me) are going to be in heaven! From My Baking Addiction :: Click HERE for the RECIPE Try these on nights when you just need an easy dessert! 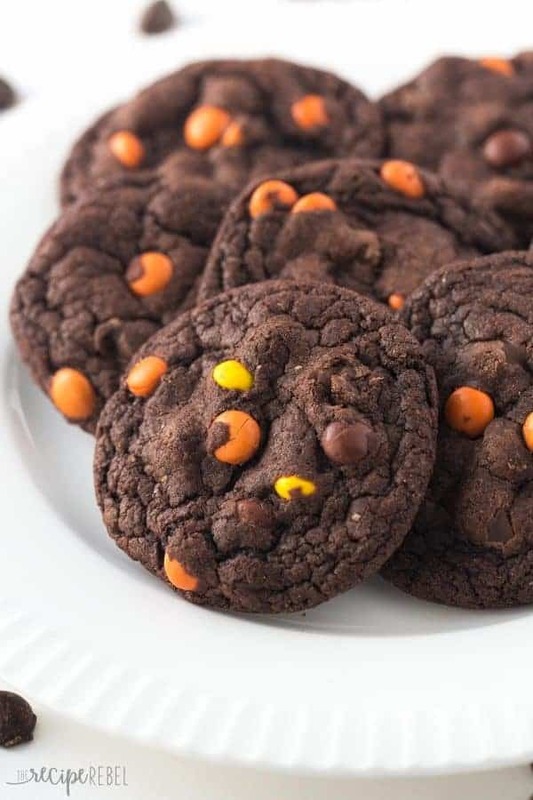 From Wishes N Dishes :: Click HERE for the RECIPE Giant Reese’s Pieces Chocolate Chip Cookies are the perfect combination of peanut butter and chocolate. These are the absolute best soft, chewy, thick cookie recipe! From Like Mother Like Daughter :: Click HERE for the RECIPE Not your typical magic bars, these are topped with of course reese’s pieces, chocolate chips and then the best part sweetened condensed milk, but i added a little peanut butter to mine to make that peanut butter taste even stronger. 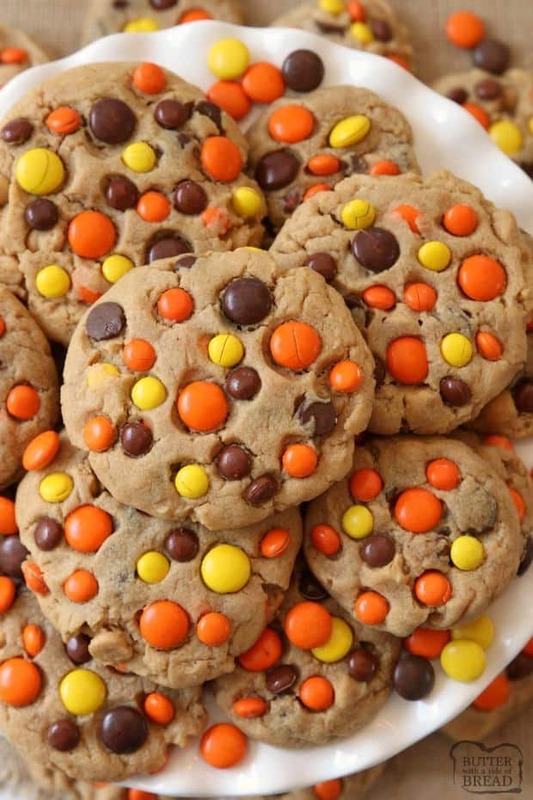 From 5 Boys Baker :: Click HERE for the RECIPE Are you a Reese’s Pieces lover? I am (surprise, surprise), so when I spied this recipe on Instagram the other day, I jumped on the chance to make them. These are so good and so simple to make. Depending on how long you cook them, they can be gooey in the center or more “well-done”. I prefer mine on the gooey side in case you couldn’t tell from the pictures. 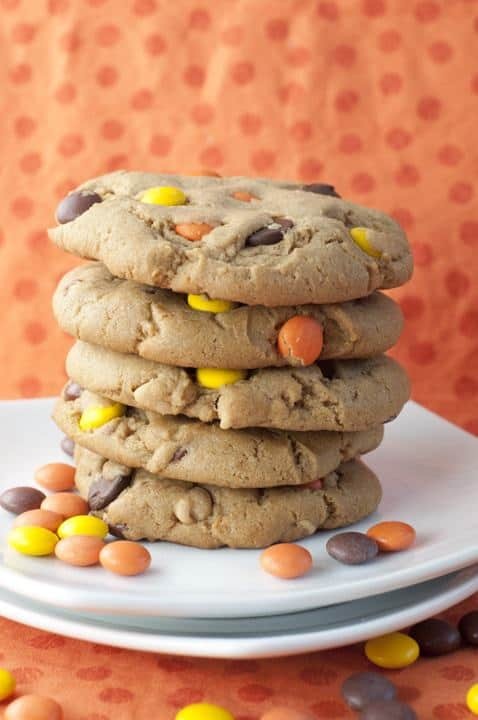 From Inside Bru Crew Life :: Click HERE for the RECIPE Adding extra cookie chunks and candies make these Nutter Butter Reese’s Pieces Cookies a fun treat to find in the cookie jar. 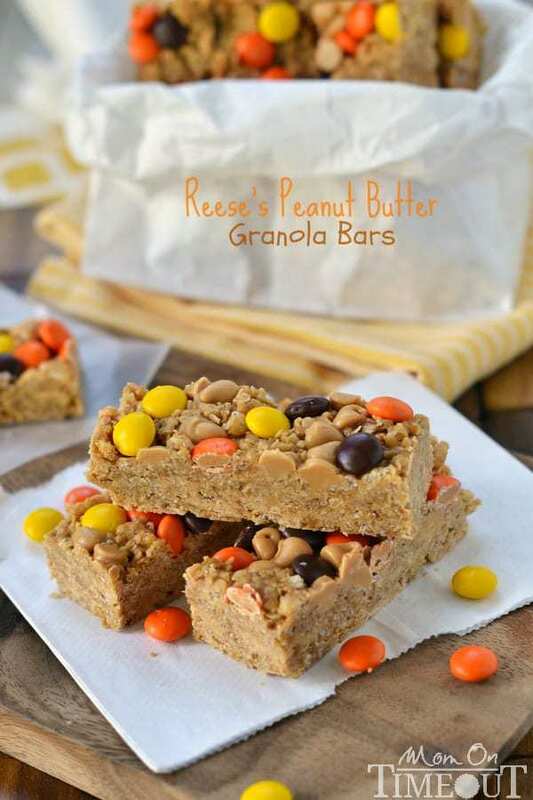 From Mom On Timeout :: Click HERE for the RECIPE These easy no-bake Reese’s Peanut Butter Granola Bars are hard to resist for kids and adults alike! 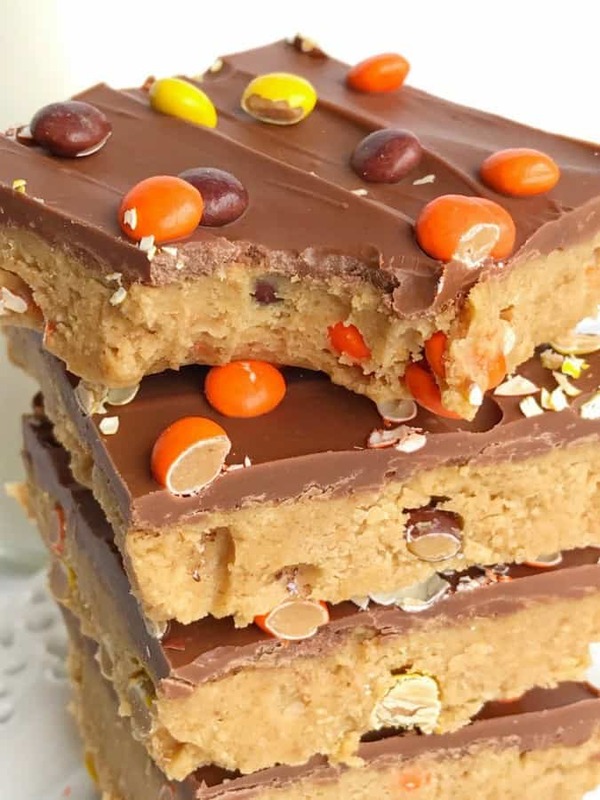 Packed with delicious peanut butter flavor and topped with Reese’s Pieces, these bars are truly eye candy! 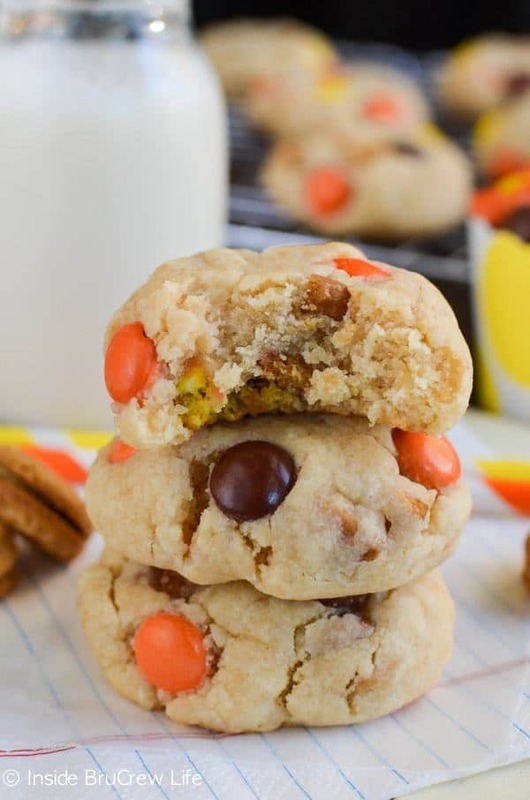 From Butter With A Side Of Bread :: Click HERE for the RECIPE Best Ever Reese’s Peanut Butter Cookies recipe made with a full cup of peanut butter! We added chocolate chips plus peanut butter chips & Reese’s Pieces to our favorite peanut butter cookie recipe to get the ULTIMATE chocolate peanut butter cookies! From Butter With A Side Of Bread :: Click HERE for the RECIPE Reese’s Fudge with a smooth, creamy texture & peanut butter flavor that’s only has 3 ingredients! 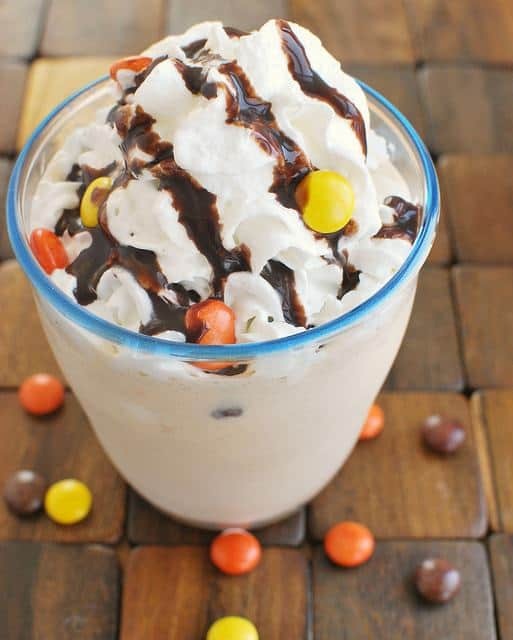 Topped with mini Reese’s Pieces for flavor & fun. From Tastes Of Lizzy T :: Click HERE for the RECIPE Homemade Reese’s Chocolate Peanut Butter Brownies with thick, rich peanut butter frosting and Reese’s Pieces. A special treat for chocolate and peanut butter lovers! From This Is Not Diet Food :: Click HERE for the RECIPE Chocolate Peanut Butter Blondies are a rich decadent dessert perfect for peanut butter lovers. 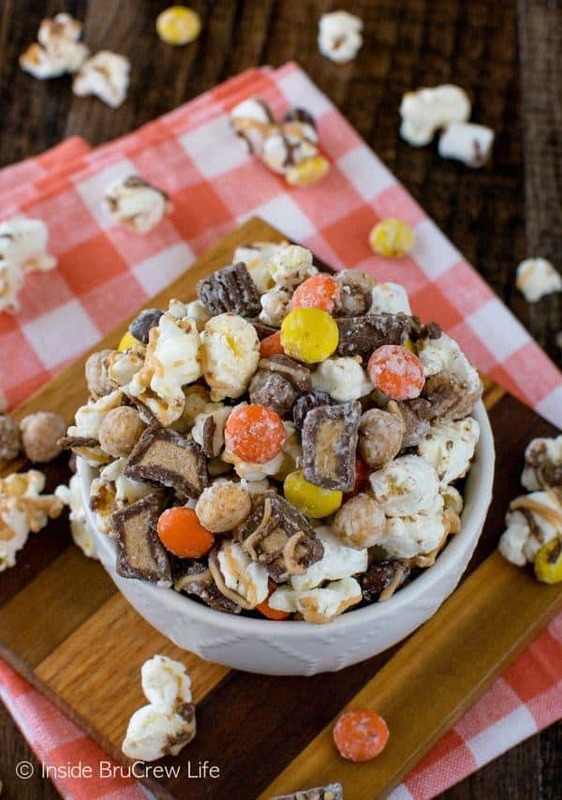 From Inside Bru Crew Life :: Click HERE for the RECIPE Three kinds of peanut butter goodness makes this Reese’s Popcorn an unforgettable snack mix. It’s great for munching on for movie nights or for packaging in gift bags for holiday presents. From Delightful E Made :: Click HERE for the RECIPE The ultimate dessert pizza for any chocolate and peanut butter lover! 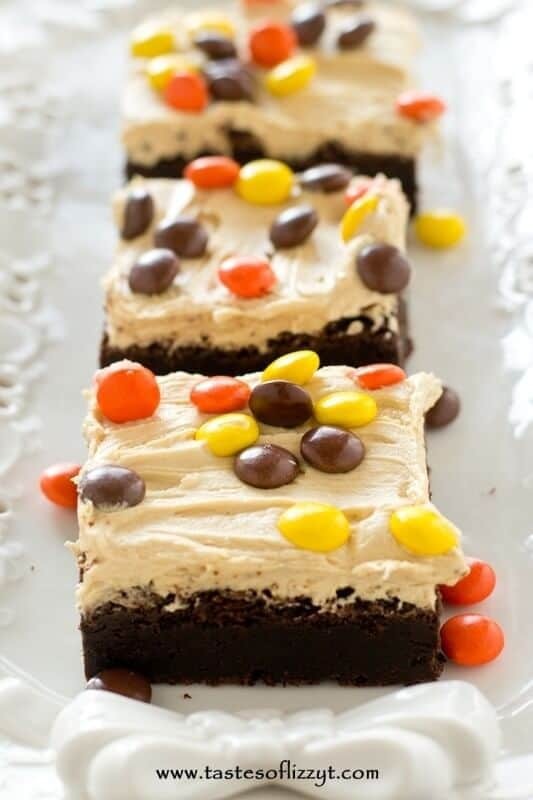 Loaded with REESE’S Pieces, Peanut Butter Cups, Mini’s, Peanut Butter Chips, and a chocolate peanut butter frosting, this brownie is the perfect snack time treat! 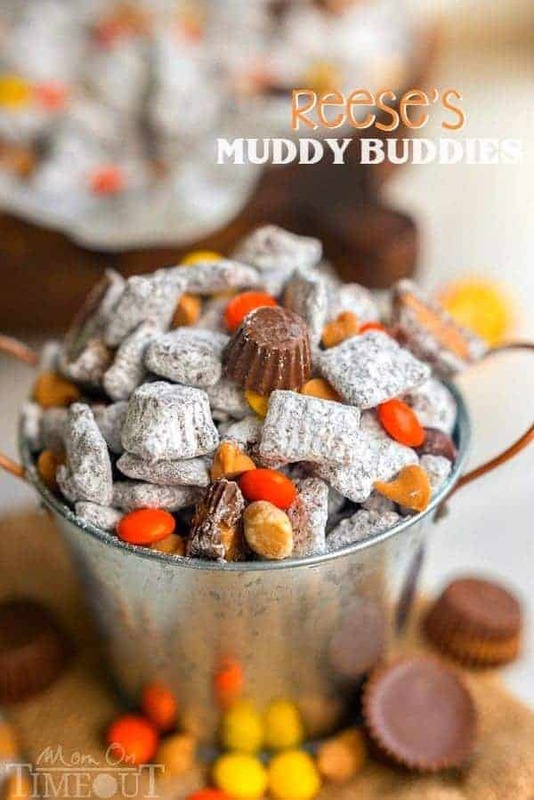 From Mom On Timeout :: Click HERE for the RECIPE Reese’s Muddy Buddies are taken to the next level in this amazingly delicious and easy recipe! Reese’s all the things! Reese’s Pieces, Reese’s Peanut Butter Chips, Reese’s Minis, and Reese’s Miniatures are all perfectly happy sharing space in this powdered sugar coated wonder land known as Muddy Buddies. From Life Made Sweeter :: Click HERE for the RECIPE Reese’s Peanut Butter Chocolate Cupcakes are perfect for the chocolate and peanut butter lover in your life. 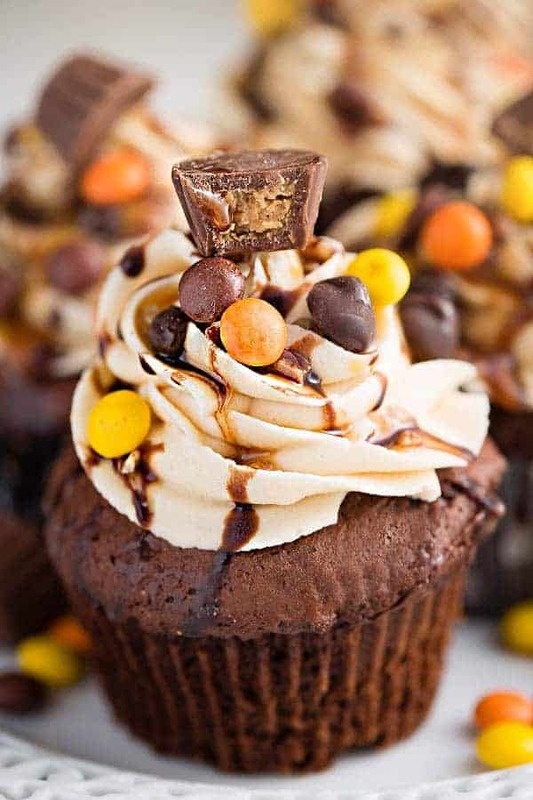 Rich chocolate cupcakes are topped with a creamy peanut butter frosting, Reese’s pieces, a mini Reese’s peanut butter cup and a drizzle of chocolate. 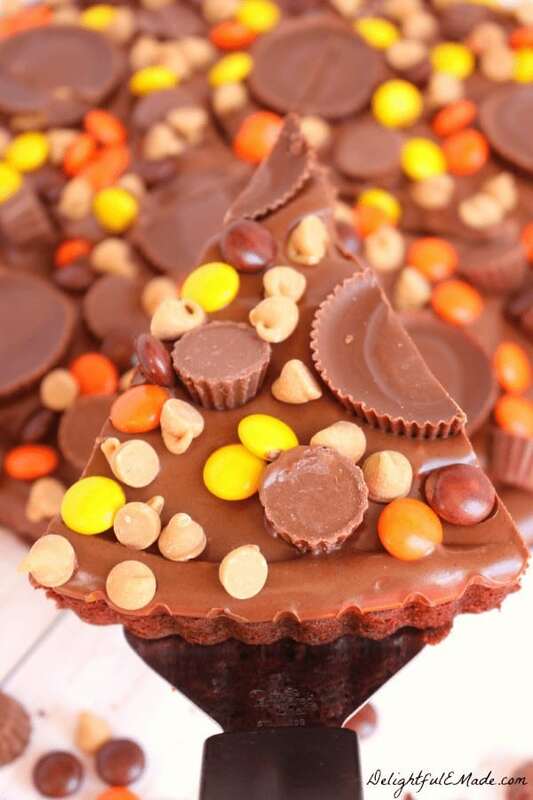 From Mom On Timeout :: Click HERE for the RECIPE Calling all Reese’s lovers! 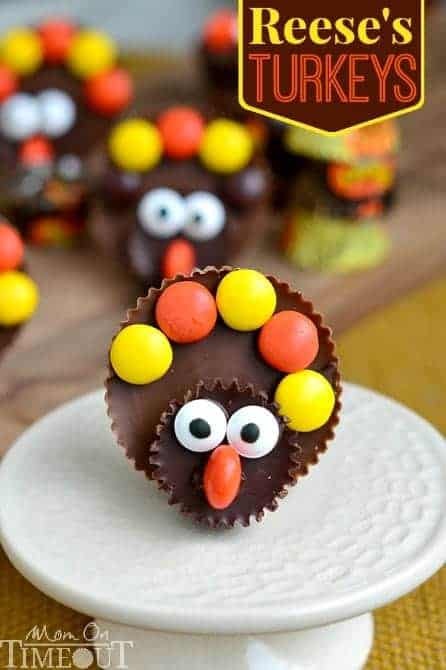 Look no further for the perfect Thanksgiving treat with these completely adorable Reese’s Turkeys! From Life Made Sweeter :: Click HERE for the RECIPE Reese’s Peanut Butter Oatmeal Skillet Cookie are perfectly soft, chewy and loaded with the best combo of peanut butter chips, mini Reese’s pieces, and Reese’s peanut butter cups. It’s a peanut butter lover’s dream! 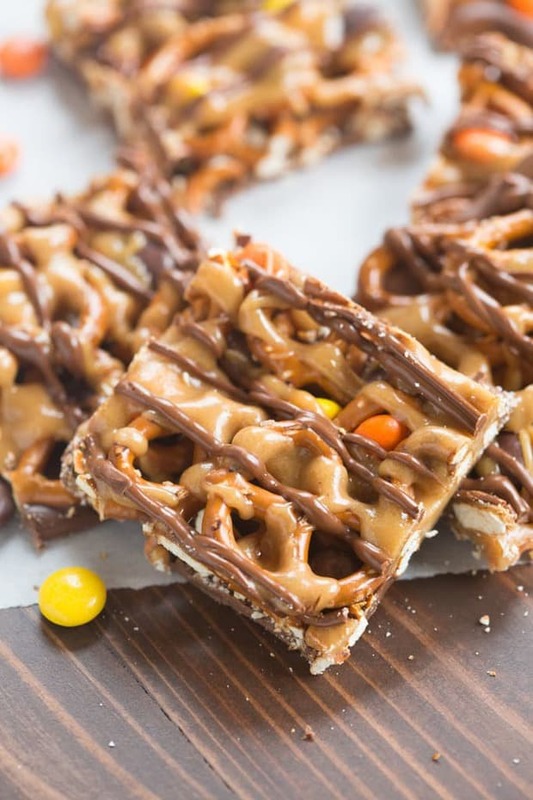 From Tastes Better From Scratch :: Click HERE for the RECIPE Layers of chocolate, mini pretzel twists and Reese’s pieces candy are topped with a yummy homemade peanut butter sauce. These Chocolate and Peanut Butter Pretzel Bars are the perfect NO BAKE, sweet and salty treat. From Love From The Oven :: Click HERE for the RECIPE Not only are these babies topped with Reese’s Pieces, but I used Reese’s Chocolate and Peanut Butter Spread in them as well. Sometimes less isn’t more, that’s all I’m saying.